Still counting my blessings ... glad that I'm one year older and still surviving ... ^-^! 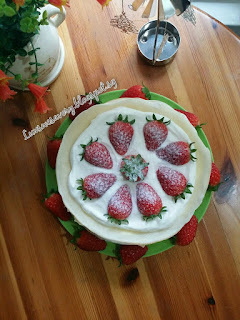 Made this Strawberry Mille Crêpe Cake for my birthday and a small 'tribute' for my blog turns 2-year old in January. Some cooking oil for greasing the pan. 1) Combine and mix ingredients (A) in a clean bowl. 2) In another bowl, make ingredients (B) : whisk eggs with a manual whisk and mix in the melted butter. Next, pour the milk in and continue to whisk till combined. 3) Add in (B) to (A) mixture and whisk till a smooth batter. 4) Heat the non-stick griddle or pan with low flame. I'm using a 20cm non-stick pan. Dap a little cooking oil with kitchen towel and lightly grease onto the non-stick griddle or pan. 5) Pour crêpe batter using a small soup ladle or big ice-cream scoop, swirl to cover the surface of the pan. Cook about 1 minute. Using a chopstick to tip the side, with your fingers, gently and carefully flip the crêpe over, continue to cook for about 30 seconds. Remove the cooked crêpe. Repeat this process till finished the batter. Reserve about 10 whole strawberries, cut each halves for decoration. For the filling, hulled and slice each strawberry thinly into 4 slices vertically. Pat dry with kitchen towel and aside in the refrigerator. Freeze the cleaned mixing bowl for about 10 minutes. Take it out from the freezer, immediately put all together the cold whipped cream, caster sugar and vanilla extract in the cold mixing bowl. Use the electronic mixer to whisk till stiff peaks form (about 4 - 5 minutes). Place one crêpe on a large plate or cake board. With a small spatula, spread a thin layer of the whipped cream on the crêpe. Place about 6 - 7 slices of *strawberries. Spread another thin layer of whipped cream. Next, top with another crêpe and repeat the same process till finished the filling. 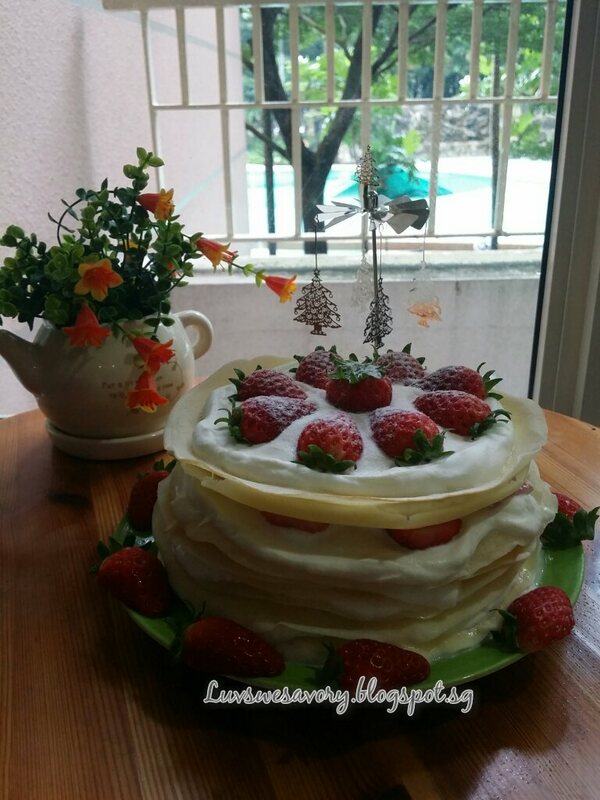 For the final top layer, spread some whipped cream and decorate with some strawberries as you like. 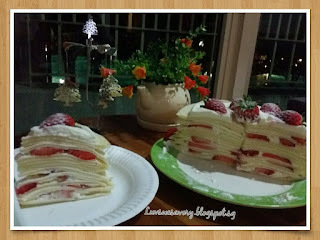 Chill the crêpe cake for a few hours before cutting/consuming. Dust the decorated strawberries with some icing sugar or snow powder when serving. (optional). 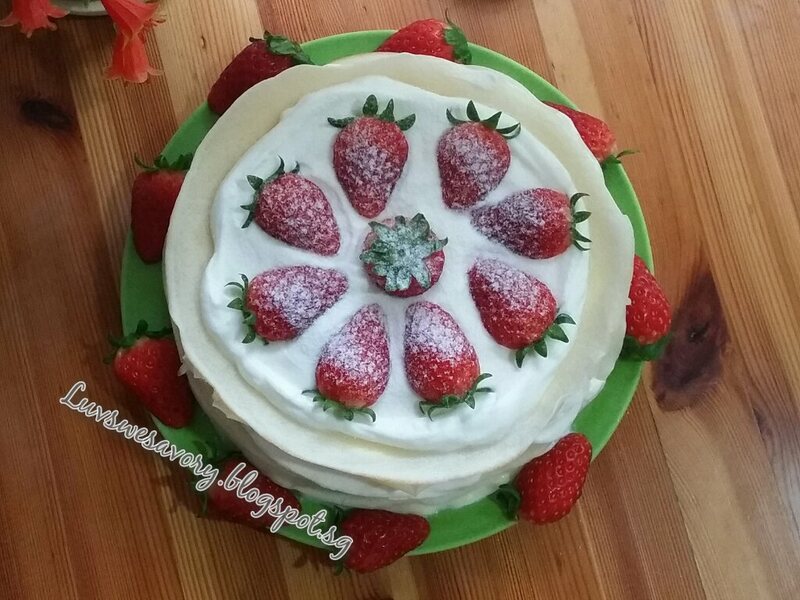 I didn't fill every layer with strawberries. Filled the initial 4 layers and alternate the last 2 layers. Feel free to fill each layer with sliced strawberries but you'll need to add more quantity. I ran out of all-purpose plain flour, replaced with cake flour. Happy Birthday to me ^-^! Happy Birthday Karen! A year younger and a year wiser :) Your Strawberry Mille Crepe looks awesome and I am sure it also taste awesome! Thanks Phong Hong. Hee ... hee... younger & wiser ! Happy Birthday Karen! Thank God for everything. Beautiful crepe for your birthday. God is good, all the time! Thanks Amy. Happy birthday and Happy Blog anniversary Karen, and what a spectacular cake you have made, this could easily be my favorite........ love everything about it. Happy birthday to you, Karen! And also happy anniversary for your blog. I am sure your crepe cake tasted very yummy! 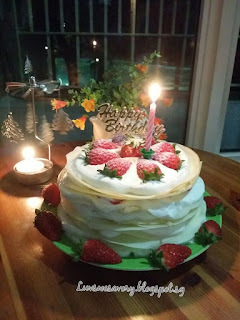 Happy Birthday to you and your blog! Very impressive cake!!! I didn't know you have a blog, anyway not too late! I must learn from you. Once again happy birthday to you! Happe birthday to You and your blog !